All of them had had prior experience in music. Lisette soon became ill and had to leave the band; she was replaced by Jerney Kaagman in 1969. Kaagman had only sung in school bands prior to joining. Kalis was also replaced - by Ton van der Kleij (drums, ex-Summer) - in the following year. It was this line up of the band that supported Golden Earring on their tour. (George Kooymans landed Golden Earring their first hit in January 1970 with "Seasons".) With Chris Koerts as the principal songwriter, the band forged ahead with new original material. "Ruby is the one" and "Wild and exiting" became enormous hits in the groups homeland. Their newfound success instantly brought so many booking requests that the band decided to turn professional. An unbreakable string of very successful hits followed with "Invitation" (71), "Storm and Thunder" (71), "Memories" (72), "Maybe Tomorrow Maybe Tonight" (73), "Love of Life" (74), "Only Time Will Tell" (75), "Thanks For The Love" (75), "What Difference Does It Make" (76) and "7, 8th Avenue" (77), as the fans noticed the group's material deviating from the hard-edged progressive rock sound towards mainstream 70s pop. The bands early hit singles were distinguished by the heavy use of mellotron, and they are generally considered to be the best of the bunch in Holland, and abroad. With later LPs, Earth and Fire lost some of their charm, compared to the earlier days, by sounding increasingly more poppy, mainstream, and pretentious, thus gradually losing most of their popularity towards 1977. However, through the years, the band evolved, rather than lost its identity. In 1978, drummer Van der Kleij was the first to leave, followed shortly by bassist Theo Hurts. They were replaced by Appie Tamboer and ex-Focus bassist Bert Ruiter (Jerney's new boyfriend) respectively. The band didnt play live much anymore, at the end of the 70s, and the demos for the new album were rejected by Jaap Eggermont, their producer. 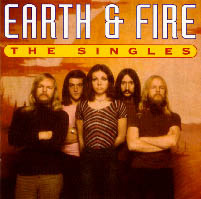 Earth and Fire then proceeded to switch their record labels from Polydor to Vertigo, with which they recorded and released 1979s "Reality Fills Fantasy", produced by Gerrit Jan Leenders. This album, which was once deemed by Eggermont as "not having enough commercial potential", became the bands greatest succes to date! The single, "Weekend", hit the top of the charts and stayed at No.1 for weeks, in several countries! However, in early 1980, Chris Koerts left the band. His position was taken by Ronnie Meyes (previously with Brainbox). With him in the fold, the band recorded their significantly less successful "Andromeda Girl" (1981), but the followup, "In A State of Flux" (1982), scored fairly big! On this album, the group returned to their funkier roots. It combined punchy, concise, melodic rock with some symphonic arrangements, at last making an overdue comeback. "Twenty Four Hours", a song by Gerard Koerts, subsequently became a hit. The Spring of 1983 saw Earth and Fire reduced to a trio. Meyes went on to join The Millionnaires, Tamboer, and Het Goede Doel. The band finally split up at this stage, and didnt reform until 1987, with Ton Scherpenzeel (ex-Kayak) to record the powerful and popular comeback album "Phoenix" (1989), featuring the hit single, "French Word for Love". Meanwhile, brothers Koerts released an all-instrumental new age album, "Frames" (88). She was the first singer in Earth & Fire in 1968.